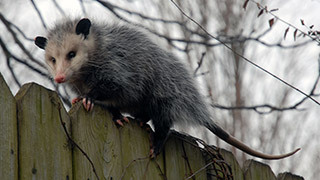 Opossums are medium sized mammals living throughout the America's. They originate from South America, but due their flexible diet, they've spread over the entire continent. Opossum babies are born after just two weeks after which time they live for 3 to 4 months in their mother's pouch. They can reach an age of just 2 to 4 years.